This is like super old, but I just came across it. 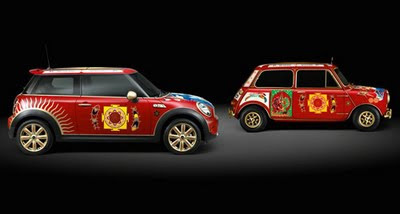 Looks like the good folks at MINI create a sweet interpretation/homage to George Harrison's classic 1966 Mini Cooper S. Apparently each of the Beatles were given a Cooper S by their manager that year and George has his decorated with a smorgasbord of psychedelic symbols. MINI has create a throwback version in celebration of 50 Years of MINI.